Saray Smalls welcomes University Recreation’s Assistant Director for Fitness, Gabby Dickey to discuss the topic of physical wellness. The two talk about the fitness facilities on campus and the services and opportunities those facilities can offer you. They address common excuses for not exercising and share fitness hacks to help get you on the road to physical fitness. Saray Smalls: Hi Everyone, I am Saray Smalls and this is Smalls Talk. This podcast is designed to be the ultimate quickie to provide you with the energy you need to make informed decisions concerning your total well being as a college student. Each episode of Smalls Talk will feature one of the eight dimensions of wellness including social, emotional, physical, environmental, spiritual, intellectual, occupational and financial. Today’s episode focuses on physical wellness. Physical wellness includes proper care for the body as it relates to both physical and nutritional well being as a means for it to operate in optimal condition. Today’s topic is Where do I Fit In” as we help students fit into their daily lives. So thank you guys for tuning in today. I am sitting here with the amazing Gabby Dickey. Hey Gabby. Gabby Dickey: Hey Saray. How’s it going? SS: It’s good. Thank you for being here. GD: Thanks for having me. 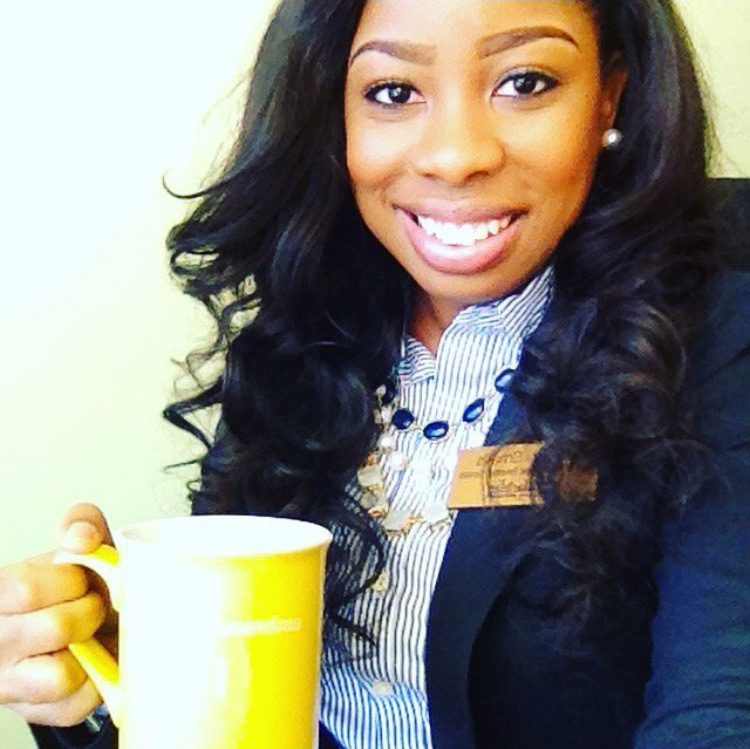 SS: So Gabby Dickey is our Assistant Director for Fitness with the University Recreation. Before we jump in today’s topic just tell me about UREC and Fitness, where they’re housed or located on campus and what the goal of that department is. GD: Yeah, UREC is really the playground for Appalachian’s students. Our main offices are located in the SRC and that’s on Bodenheimer Dr., West Campus. UREC encompasses outdoor programs, club sports, intramural sports, aquatics and, the area I oversee, the fitness area. That entails the personal trainers, the group fitness instructors and the weight room staff. SS: Cool. So for those of you that are listening Gabby is actually an alumni of Appalachian State. So during your time at App, when did you find this interest in fitness? GD: I think it really began with Group Fitness when I auditioned to teach for App and I think the love just blossomed as far as wanting to be more educated in fitness and exploring that passion. SS: Cool, cool. Again, for our listeners, topic inspiration. Every episode I try to give you guys an explanation as to why we are talking about this other than it is related to one of the eight dimensions of wellness. Gabby have you seen that Taylor Swift commercial when it’s an Apple Music commercial and she’s running on the treadmill? SS: Okay then let’s talk about this commercial. We’ve probably had this conversation this before; I probably have spoken to several people. I am laying bed one night, just exhausted from work and then Taylor Swift comes on television and she is running on this treadmill. She is just having a ball and I am so frustrated because she was like so super thin and looking amazing as Taylor Swift would and then she starts rapping. I thought, Oh my gosh. Could this commercial get any worse, I just want it to end. Then she falls off the treadmill and I am dying laughing. I am just so happy that Taylor Swift has fallen off this treadmill. For those that don’t know me very well she is not my favorite person, but that’s another the story. Overall it just brought so much joy to my heart and it made me want to work out interestingly enough. Also talking about inspiration for this topic, I have had a conversation with you about my own fitness goals and me working out at Mount Mitchell, which is one of our fitness facilities on campus, and really psychological gym-timidation. So we will talk about that in a little bit. It’s always around the time where I want to lose weight or I want to get fit or I’m about to go on a trip and someone’s going to take a lot of pictures of me so I want to make sure that I look good on the pictures and all these things. Therefore, I think that when it comes to working out I that the media holds a strong play with what our goals are, our aspirations are and I think that a lot of the time our goals aren’t realistic. I would like to get into that a little bit too. GD: So what are your goals? SS: My goal right now is...I really don’t know. (Both laugh) I think my overall goal right now is to just be physically active. SS: With the work that I do, most of time is spent, probably 70 percent is spent at a desk. I do a lot of coordinating and planning. I am on AppSync, setting up events or emailing folks. So a lot time spent sitting down, so I need to make sure that I am being physically active. There are a number of illnesses that run in my family. I have family members that are dealing with hypertension and diabetes and my mother is a breast cancer survivor. I understand how important it is for me to be physically active and how being physically active can combat the onset of some of those conditions. I don’t think it's overall “I want to look like Beyoncé or Taylor Swift,” but it’s that I just want to be in the very best physical shape that I can be in. That first starts with small steps. For our game today, we are going to take it back old school. So even just listening to me talk just now about my goals, my personal goals for fitness sounds exhausting. It sounds painstaking and work. It doesn’t sound fun. So thinking about fitness, what was fitness like when you were children? Gabby, what were some of things that you did as a child for daily fitness or what have you. GD: Yeah. I had a father who would often lock me out of the house and the most creative thing I could think of to do was go over to a friend’s house and we would kind get into things. Whether that was climbing trees, going into playhouses or playing in the dirt even. That would be my experience as a child in fitness, especially when I was young. Then I was a little bit older, my mom started to take me to group fitness classes that I was allowed to go to. That was fun. SS: I think for me, it was definitely being kicked out of the house. After school, I had an aunt who actually passed away, who would pick me and all of our cousins up from school and take us to her house where our parents picked us up. We would sit in the house and do homework for whatever amount of time we needed to do homework. Once homework was done, she would be kicking us out of the house. She had to start dinner or has to start cleaning, so we were forced to be outside. We were riding bikes up and down the street, we were playing hide and go seek, and freeze tag. Do y’all even know what freeze tag is? We played Red Rover! GD: Oh! I used to love Red Rover. SS: Just getting outside and having a ball. Sweating, running around. It was great. GD: And not even thinking about it as exercise. SS: Exactly. So you’re being physical without, but it doesn’t feel like another job that you have to do. It wasn’t like oh I have to do this today, but yes I get to go outside today. And then on the flip side too, as kids, when we weren’t allowed to go outside it was like the end of the world. GD: Yeah it was punishment. SS: Yes! Can I go play with my friends? Nope you have to stay in the house and read a book or you can sit here and watch TV. Nowadays I think that younger populations would find that totally acceptable and would enjoy it. Yes I will sit here and sit on my phone or what have you. I think that’s one of the differences in our childhood now are our personal interests so to speak. So let’s think a little bit about fitness. We’ve said that word probably thirty or forty times since we’ve been recording. So Gabby, what exactly is fitness? Like if you could define it, how would you define fitness? GD: So fitness is your ability to adapt to your life. Your daily life tasks. So if you take a flight of stairs and you feel out of breath, that’s a sign that you may need to work on your fitness. Get into the gym more. Do something that you find fun to improve your personal fitness. Scientifically, the items that relate to physical fitness, are your muscular endurance, your muscular strength, your cardiovascular endurance, your flexibility, and your body composition, but that could mean a lot of different things for different people. SS: Cool. So let’s think a little bit about the benefits of fitness. Why is fitness important? Like why would someone want to do it? Why should someone do it? Why is that important? GD: Right. The immediate benefits of fitness are those functional tasks. Looking at a flight of stairs, you can go up much easier than you could before. Other fitness benefits would be strengthening your muscles, strengthening bones, strengthening your heart, but also strengthening your head. What I mean by head is strengthening your self-confidence and then strengthening the focus, which will lead to other benefits, such as improved grades in the classroom. SS: Interesting. So basically what you’re telling me is that if I work out, I’ll feel better about me? I mean, I don’t know if I could feel any better about me. GD: Well there’s a balance so I wouldn’t go too crazy, but if you work out consistently in a way that benefits your body, then yes you can definitely see those benefits. SS: So let’s think about what are some reasons that people just absolutely don’t like working out, less inclined to work out, don’t want to do it. What are some of the key situations or reasons that you think are why people don’t necessarily want to work out? GD: Well, a big one is that gym intimidation. Going into a place in which you’re not familiar with the equipment or even what to do and feeling overwhelmed by that atmosphere is one of the biggest issues. SS: So it relates a lot to access right? Access is this idea of do you have access to the items and resources that you need to be successful. So do you have access to a gym? Do you have access to certain gym equipment? Relating that to gym intimidation my personal experience was that I was fearful of going into Mount Mitchell. Mount Mitchell is one of our smallest fitness centers on campus. I was like what if I walk in and I’m a machine and I think I know what I’m doing, but it’s clearly wrong and no one tells me. Then they would be laughing at me. So there’s this constant like, are people watching me? I think the truth is when you go into the gym; no one is paying attention to you. No one cares that you’re there. I mean we care that if you’re there, but if I’m working out I am not concerned about the person next to me. GD: Right. I see that a lot more with women. Being more self-conscientious about using gym equipment. I am hoping that that will change in the future as we educate women of the benefits of strength training especially for women. I definitely encourage girl’s guys anybody to come out and give it a try. It is something that will lessen with time and get to know the equipment. Try and use one new machine each time you’re in the facility will really help with that. SS: I know that I mentioned that Mount Mitchell is one the locations that we have on campus. GD: Yea, can I make a note about Mount Mitchell? GD: A lot of people don’t realize that it’s even there. GD: Yes, they don’t know anything about it. So it’s in the Plemmons Student Union, third floor I believe. So yes, it’s definitely there. We have two other locations. The other one is the Quinn Recreations Center. And in the Quinn Recreation Center is where most of our powerlifters or Olympic lifters will tend to work out at because it has the better equipment for those types of lifts. That’s located right across from the Football Stadium, up that hill. I believe its Stadium Dr. Then the SRC is just down the street on Bodenheimer drive. Typically most people don’t have a problem finding that one. SS: You can’t really miss it. The SRC has a climbing wall and it has a pool. Lots of different activities to engage in at the SRC. It sounds like the Quinn is more like strength training and then Mount Mitchell is a little mix of everything. Mount Mitchell has your weights, smaller sets of weights. You also have your elliptical and other machines as well. SS: Awesome thanks. So let’s get back to some of the reasons why people are not working out. I think, having worked out at Mount Mitchell, because it’s a smaller gym if you do not get there at a certain time then you are not going to have the equipment that your may want to use. I am an elliptical girl all the way, I get off of work at five and if I am not at the gym between 4:50 and 5:00, most of the cardio machines are probably gone. That just really ruins your workout in a sense because you think I am going to start here, I am going to do this. If you cannot start with the machine that you want, it can be really difficult. So I think that is another reason why that some people struggle. They think they I am going to get there at a certain time or I’m not going to get there so why even bother. GD: So I think that’s where gym etiquette really plays in when someone has been using the machine and it’s been an hour, especially on a cardio machine. I’m not sure you would want to do that much cardio anyway, I am not a cardio girl, but that’s when noticing that people are waiting for a machine would be beneficial to our student community. Sometimes we do have that space and equipment limitation, especially around New Year’s and those peak times. SS: Yeah, so what are some other reasons that you think that people struggle with working out? GD: So during those peak times too can be either beneficial or the opposite for people looking to go to the gym. It could be that people don’t want to go in January because they know there will be a lot of new people. It could also be certain times of the day, like you mentioned before, when it’s just really busy with our students. Typically around 4-6 is our peak hours in the afternoon. SS: Full faced makeup and their smiles with their perfect teeth and exercise balls. GD: And glistening sweat. Not that nasty stuff. SS: No. Not that drippy stuff that runs down the side of your cheek. It’s that nice look. Like they’ve just been misted with baby oil. It’s like they’re in a music video. So I’m scrolling asking myself who looks like this. Nobody looks like this. Nobody at any of the gyms I attend looks like these fitness images. So I think this other reason why folks don’t necessarily work out and they find it intimidating is what society deems as fitness. It’s this idea that you have to look a certain way to be physically fit. I know there are people that have varying body types and sizes that are so fit. They are probably more fit than someone who would be a size zero or two. SS: I think also those images and if you spend a lot of time on Instagram or Facebook seeing these pictures of other people can distort your image or your personal goals when it comes to fitness as well. GD: That can play into not wanting to even start if people feel overwhelmed by an image that they think portrays what fitness is. We have to realize that's not at all realistic for the general population. We are doing the best we can. We don’t have the perfect diet and the nutrition plan and the personal trainer. So it is what it is. You have to take it with a grain of salt. SS: You do. You have to set those realistic goals. If I walk in a gym. Yall know I always mention Beyoncé. But if I walk into a gym and tell a personal trainer or even myself that my goal today is to look like Beyoncé in the next two weeks. Beyoncé has been working that body out for years and so for me to have that goal in that period of time is unrealistic. What are some realistic goals that students can set when they go to a gym? GD: I think it makes sense to get an evaluation of where you are currently at and what you are currently doing. If you really enjoy what you are doing as long as it’s not nothing...just increasing the time would be one of the small changes that you can do. If you are doing nothing currently and want to get more physically fit then just starting somewhere...not necessarily a specific plan or exercise. It could just be moving more or going on a walk. It could be parking further away. You have to really start from where you are personally and then progress. SS: I agree. That goes back to the idea of small steps. So if you’re someone who is able bodied and you take the elevator often, then take the stairs. That’s just a few more steps you’ll get in. It’s a little bit more of an incline. Just start taking the stairs more often. I remember when I first started working at App I was taking the stairs and I could barely breath. I would try to talk to someone while I was on the stairs and have a conversation and I stopped in the middle and got winded. It was because I hadn’t been working out. I hadn’t been in that routine for a long period of time. So it’s important to start with baby steps. You don’t need to say I’m going to go out and run ten miles today. That doesn’t make sense. You can’t just get up and do that. GD: I think a lot people make that mistake and that’s what stops them from progressing. They go crazy and hard and they exhaust themselves and it’s not fun anymore and they stop doing anything. That’s really what I am most passionate. It’s lifelong health and fitness. Just taking small steps and being really consistent in those daily behaviors. I think exercise should be something that is scheduled similar to the same way that you shower everyday. You should do some type of physical activity everyday. SS: I hope that you shower everyday. If you don’t just don’t tell anybody. GD: I think it’s making it a commitment to yourself and appreciating your body for what it can do and having a respect for that. That’s what fitness is to me and that’s where my passion has come from. SS: So living in Boone, it’s not unlikely to see folks running across campus and town...biking jogging walking. GD: Yeah we live in a great area for those types of activities. I believe our outdoor programs won an award just recently in an outdoor magazine for Appalachian being a great community for outdoor activities. SS: I think what really gets me is if there is a day that I decided to skip the gym like yesterday and the day before and I’m driving down the road headed home and I see someone who is much older than me legit running, I feel bad. It’s like if they can do it then I can too. So definitely using our environment as a motivation so to speak. If you see all these people working out you feel more inclined to be physically active. Another reason why I think some people struggle with being physically active is just not having that knowledge base that they need. It’s this idea of not knowing what I rep is or what sets are or how to use a particular machine or what workouts they should be doing. What are some things you would suggest to those who really don't have that knowledge base when it comes to physical fitness? GD: One of the resources our weight rooms have are the weight room attendants. They are most often exercise science majors. They are there for you. If you have general questions about how to use a machine or what bars weigh they can answer those questions. We also have UREC personal trainers who can customize a plan for their clients. SS: Cool. I think for those of you who are super shy or bashful definitely utilize YouTube and Google. There have been days when I was like, “I want to try a new core exercise.” Then I’m going to YouTube core exercises and somebody in a video will show me what I need to do. Then I will go the gym and do them. Do a little bit of research before you go to the gym. GD: Yeah but when you do that make sure that it’s coming from a reputable source. SS: Also if there is a machine I’m really big into gym stalking. GD: What does that mean? SS: So basically if there is a...I did this last week. Sometimes I get a little scared about the different machines. I want to use them but I don't want to look completely foolish so I’ll just wait for somebody else to use it and just like you know not stare at them but stare at them while they are doing it I watch their form and learn how to use it and then as soon as they get off I’ll jump on it and do the same thing. So gym staling works. You can find a friend. Sometimes in the gym there are people struggling to adjust a machine so that’s a good way to just say, “Hey you adjust it like this.” You know because you have totally gym stalked every person at that particular machine so you now know how to use it. So that’s a good way to make friends. So there you go! That one’s for free. As we mentioned we were having a quick conversation before we came into the studio about fitness and what it was like when we were younger in preparation for the game and you mentioned that you spent some time with your Mom and she took you to fitness classes. So this other side of the coin as to why people do or don’t engage in physical activity in their adulthood is what their beliefs were when they were younger so you saw your mom working out and you worked out. You believed that that was a way of life that you are supposed to do to be a healthy person. To be an adult and to be taken seriously or what have you. You saw that behavior and said this is right. This is good. GD: This is a part of what we do normally. SS: Definitely. I think for me...Hey Mom...I feel like I talk to my Mom every episode. My Mom wasn’t really going to the gym. She had three kids and that wasn’t time that she was able to make but she spent a lot of time working in the yard. She is a yard girl from her heart she will go out there and garden her soul out and cut the grass and come in sweaty. She is a big kid about it and she loves it. So that idea of physical activity doesn't have to equate to a gym. It can be something outdoors that you really enjoy doing. Something that’s going to push yourself or your body beyond that normal limit to really get that good workout in. Something else we mentioned too are the attitudes behind fitness. What are some of the attitudes that you hear students have regarding physical activity and fitness? GD: If they are not in love with fitness because most of my students are they are on the opposite end and think it’s really boring. They are not really interested in our weight room facilities or even the group fitness classes so that is an attitude that we are working on changing steadily but surely. SS: Another one too is that emotional attitude that you have about working out. There are some days when you work out and feel so relieved. You are so relaxed and happy and think you’re going to sleep well. Then there are other days when you are like, “I’m just so sad I don’t want to workout.” So finding that emotional balance regarding working out as well. GD: Right. With anything wellness related it should be a balance. It shouldn’t be that you’re in the gym seven days a week because I don’t want to see you there. It’s not a healthy way to live your life and it would negate what you are trying to do so yes give yourself a day or two of rest. Do what you really feel is beneficial for your body. I really think we should listen to our bodies. If it's just not that day. If you’re not feeling like working out that day just relax. As long as it’s not becoming a habit then there is nothing wrong with a rest day or two. SS: Sure. Now if your rest day turns into a rest month. GD: Or a rest year. SS: Right! Then you now we need to talk but rest days are completely acceptable. I am on rest day three. Haha OKAY. Fitness hacks. I have a colleague...Hi Elizabeth! We definitely talked before the show. We talk everyday. Her office is right next to mine. She said, “Saray I hate working out. I hate everything about it. I don't want to do it. I just need to know what are some fitness hacks? What are some things I can do to make fitness quick and easy and a breeze and will trick my brain into liking it. Right now I hate it.” So, Hi Elizabeth. That one is for you. So for people that hate working out we have compiled fitness hacks list. Quick easy ways to make fitness a little bit more fun for you so Gabby what are some things that you would recommend for students to do regarding their fitness? GD: I think the first one we should start with is just getting your mind right. Talking yourself up instead of talking yourself down. I feel like a lot of students will do that negative talk and it’s unnecessary and most of the time it’s untrue. They need to get that mental check because fitness is very mental. SS: Okay so you say a negative talk that somebody would do and I’ll combat you and make it into something positive. GD: I don’t know what I’m doing in there. SS: I know exactly what I’m doing. GD: People are going to be looking at me. SS: No one is going to be looking at me. I am going to be so amazing. GD: I am too fat to go in there. SS: I am so beautiful. GD: There is not enough time to work out. SS: I have all of the time...okay or let's just bring it back because realistically you don’t so. GD: I can make time. SS: Yes that’s a good one. Okay so I like that just talking yourself up. GD: If you just hear that and you change your negative to a positive it’s going to make your mood better and you're more likely to go after it. SS: So fitness hack number one is change your mindset. Make it a positive. What’s fitness hack number two? GD: An accountability partner. I really like those. If you have a buddy waiting for you and you bail. You are in trouble. SS: It’s the worst. I currently have an accountability partner. Daniel over in student conduct. Hey Daniel! So we meet after work and go work out. If I am late he is mad. We don’t even work out together. We do our separate things in the gym. GD: Yeah but you know that he’s going to be there. SS: Yes he’s working out and I’m working out so if he’s late I’m mad. Definitely having someone who is going to push you and encourage you to be physically active as well. GD: Yeah. And the next step above that would be having someone you actually work out with because seeing them get stronger or be able to push themselves will help you be able to push yourself. SS: Another one is just get up and move. I am a closeted dancer. I like to dance in my house. I dance before and after a shower. I dance in the morning listening to music. Cooking and dancing is like. GD: Ohh I love to cook and dance because I hate to cook but I love to dance. SS: So yeah loving to dance. You don’t have to dance in public but dancing and just move your body. Whatever that looks like for you. If you are totally beat that's fine. We are not...okay well I’m judging a little bit. But we are not judging. Just get up and move. So again it’s that idea that physical activity is not a job. It doesn’t have to be something that you are worried about every day. It can be totally fun. SS: Okay, so what else do we have on our fitness hacks list? GD: I’m going to go with have a playlist and I have a story about this. This should also be a hack, but have your headphones charged because once those die and I don’t have my playlist or my music then I’m done. Have some upbeat music that really gets you hype and motivated is the best gym partner. SS: I agree. That whole headphone thing… a couple of weeks ago I went to the gym. I was totally dressed and was pumped. I drank water all day and I could not find headphones and I was freaking out. I asked everyone in my office if they had an extra set of headphones. Luckily my accountability partner Daniel had an extra set, so I was good to go. Definitely charge your headphones, have your headphones, have your music and a playlist. I think another one too is to start small. Start with your smaller goals and small steps. Maybe I’m on the elliptical for fifteen minutes or on the treadmill for fifteen minutes. Maybe I do five sit-ups or three planks, just start small. Small sets small reps and build from there. GD: I agree with that. Definitely start where you’re at and progress. Progression is what will increase your fitness. SS: I think we have one more, actually two more on our list. I know that UREC offers club sports and intramural sports. GD: Yeah there is club sports, intramural sports that students can get involved with and there is also outdoor programs with the rock wall. If it’s not fitness again, you have other options to be social and get outdoors. SS: Lastly and I think this is an important ones too. You need to have a plan. You need to schedule and prepare for the gym. For me personally my schedule, my plan and my preparation is the night before. I pack my gym bag. If I wait until that morning, it’s not going to happen I’m not going to the gym. Immediately after work I change clothes and jet over to the gym and I already have a plan of what workouts I will be doing. Plan ahead just like some of you may have a bedtime routine where you take a shower, brush your teeth, maybe read a little or watch TV then go to bed. It should be that same routine when it comes to going to the gym. GD: For me it is just putting it in my schedule. If it's in my schedule I will do it. It’s not failed me once. I love a schedule. SS: As you all know every episode of Smalls Talk features a challenge or two or five. Today we have a couple different challenges for you all. As Gabby mentioned definitely looking at your weekly schedule and identifying a time maybe two or three times a week where you can get in at least a thirty minute workout. If it’s a break between classes or you have a three hour break and usually nap during those three hours maybe you take a little bit of time and walk on the treadmill. Maybe you walk around campus with a friend or you go to the greenway, that’s a great place to walk and get away from the rush of campus as well. Look at your weekly schedule and identify a time or times where you can build fitness into your schedule. Also there are fitness consultations and assessments you can get at UREC. This again goes into setting a goal and potentially having a personal trainer set you up over at UREC. You want to get that consultation and you actually reach out to Gabby she will share her contact information at the end of our podcast today. Setting up for that fitness consultation so you can see where you are and what is your goal and where do you want to be and how are we going to get you there. Another one is to take a fitness class with UREC. What are some of the fitness classes that UREC offers Gabby? GD: Oh gosh we have a bunch of different classes from kickboxing to yoga to cycling and Zumba or dance classes we have a lot. They are a lot of different options for our students and those classes are in all three of our facilities. We have the SRC, Quinn, and Mount Mitchell there really is no excuse with over fifty classes a week. SS: Those schedules can be found on the website right? SS: Yeah and I know we were talking about the mountaineer fitness challenge. What is that? GD: Yeah! The mountaineer fitness challenge essentially challenges our students to get 3,333 minutes of physical activity, which could be in the weight room, group fitness classes or on their own, but they do need to get a signature from a supervisor or weight room attendant. This is to just honor system get your minutes and then at the end of the challenge students get a free t-shirt from UREC. SS: Sign me… can staff sign up for this? GD: You know I guess I can make a special exception. SS: Yes! I just want the t-shirt I don’t even need the…. GD: No you need the minutes! SS: No, no I just want the shirt. GD: There are rules Saray. SS: That’s awesome. The mountaineer fitness challenge definitely look into that and see if it is something that you are interested in and want to participate in. I’m sure additional information is available on the website as well. SS: We are going to jump into our song selection for this episode. During our fitness hacks we mentioned that you have got to have a playlist when you go to the gym. So, we have done you the honor of making a playlist for you. I went through my personal workout playlist and Gabby went through hers and I touched based with a couple of friends as well to see what they have on their playlist. We are just going to run through a couple of those feel free to download them and get your playlist started. SS: Hopefully you guys know some of these songs. SS: Yeah there will be a couple throwbacks in here. Number one… what do you got Gabby? SS: That’s a good song makes you want to get up and move around. We are like bopping in the studio. You said it is Zion? SS: That is a great song. GD: I love that song. SS: Yes, lots of movement … we are jamming in the studio. Lots of movement and get up and go. I also think she has that version specifically for working out and fitness that she did with Michelle Obama. So definitely listen to that one too. Another favorite from Beyoncé is “Don’t Hurt Yourself” featuring Jack White. Definitely a little grimey with lots of cussing. That’s a good one definitely get your self-confidence up while you’re in the gym. What else do we have on our list Gabby? GD: How can you sit still? You can’t. SS: I’m sure like 98% of our listeners are like “I have never heard that song.” What else do we have? We have Drake “Jump man” that’s a really great song to listen to in the gym. GD: You know me I really like to pair my songs with my workout. GD: Lil Jon “Get Low” will be my all-time squat song because you got to get low. SS: What else do we have? SS: Oh, I love that song. My nephew was born the year that song came out and after he was born my brother and I ran into the parking lot and turned up “A Milli” we were so excited. We also have… I had to throw a Taylor Swift in there. “Shake It Off” although I really hated the song when it first came out. It is a really great gym song. SS: A good dance song. SS: That reminds me of that song by Fifth Harmony “Work from Home” that’s a cute elliptical song where I’m just getting started and getting my grove. GD: Yeah a nice warm up. SS: I know you have a fav fav that you put on the list as well. GD: Oh yes. Missy Elliott “Pep Rally.” How can you sit still? It’s like I’m feeling it. I’m feeling this workout. SS: We have one more song for you guys. What’s that Gabby? SS: Is that also a squat song? SS: Okay so now you have your playlist for the gym and you are also going to pair those songs with a particular work out. So “Shake It Off” could be with your stretches or warm up. You know I’m shaking all of the haters off. Is that what she is talking about it that song? GD: Yeah I think so. SS: What are some takeaways that we have for today’s episode? I feel like we have hit on a lot of good points. What was your favorite thing that you feel like we discussed today, Gabby? GD: My favorite thing that we discussed was that fitness can be fun. It is about changing your mindset if it’s not fun yet, and starting small. GD: Absolutely you can reach me at dickeygb@appstate.edu. Saray I did want to make a note of your friend from far away checking up on you. I love these Fitbit things for that reason. Friends all over the US have the Fitbit and the app makes it cool because you can see their steps and do challenges. SS: I don’t own a Fitbit because I just refuse. GD: How do you refuse? SS: Because that’s just another way for the government to monitor my exact location. SS: Okay tell me about this whole linking up with friends and the app. GD: There is a Fitbit app that you sync your Fitbit up to and it downloads all your steps and sleep information depending on how often you wear it. There are challenges that you can do with friends or your friend’s friends it doesn’t matter and you can win little awards and trophies on the app. It is really fun and makes you want to move just so you can win. My competitive nature makes me really excited. SS: I like that. Maybe I will invest… we will see how I feel about it. Any final thoughts Gabby before we close it out? GD: Nope I don’t have anything. I really appreciate you having me on your podcast, it has been a pleasure. SS: Of course. Thank you so much for coming we will have to do this again soon. You guys can reach Gabby at her email address and check out fitness.appstate.edu and thank you all for listening.